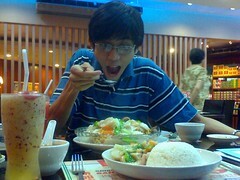 Before Gian left for Manila last summer, we had our last dinner at Picobello, an Italian Restaurant here in Davao City. Ordered some pasta (of course) and for the main course, some osso bucco (i hope i got the spelling right). He had a glass of watermelon shake and a coke for me. This craving for Italian food started when the koro boys went out and ate in another Italian restaurant in the city. So there we were, our last meal here in Davao. And you already know that I went to Manila a few days back. And so Gian and I met again for another eating spree. 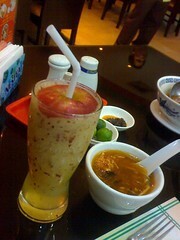 This would be our first meal in Manila in a restaurant in Glorieta called Asian Fusion (i guess). This time, I had a glass of apple shake and water for him. 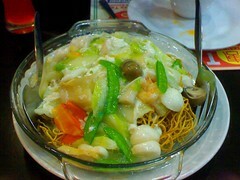 And the food was OKAY LANG – a fish lip soup and some fried noodles.